Cultures from across the globe were represented and celebrated on Tuesday, Jan. 23, during Tanglen Elementary's annual Cultural Night. A beloved school tradition, Cultural Night is an opportunity for the school community to show off their various ethnic backgrounds through dress and regalia, dance, food, and educational games. New this year was the addition of several exciting and interactive performances. Tanglen parent Susie Segal taught participants the art of the Nigun Atik, a traditional Israeli folk dance. Irish step dancers offered a glimpse into the Emerald Isle of Ireland, and dancers from CAAM Chinese Dance Theater performed a fun skit-style routine. They also showed kids how to dance with long ribbons. Even the Tanglen Tigers had something planned for the event. 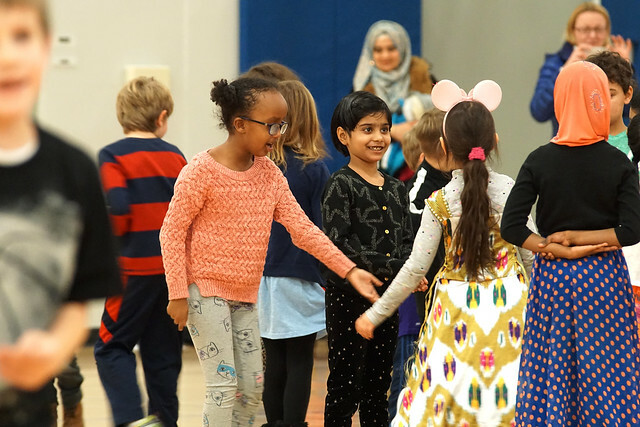 Kindergarteners and first- and second-graders learned about European, Russian, Israeli, and American culture in their classrooms and prepared special dances that represent each section of the world. In between performances, parents and students browsed the dessert bar, which included decadent and delicious treats from around the world. An Eastern European chocolate babka, Swedish gingerbread, and a Canadian nanaimo bar were just some of the few treats everyone enjoyed.